A few months ago I was asked about using an infrared filter with a camera that has not had its built-in IR blocking hot mirror filter removed. The issue with using an unconverted camera is that because they are much more sensitive to red light than infrared, you can end up with an image that is mostly red light with a bit of infrared. 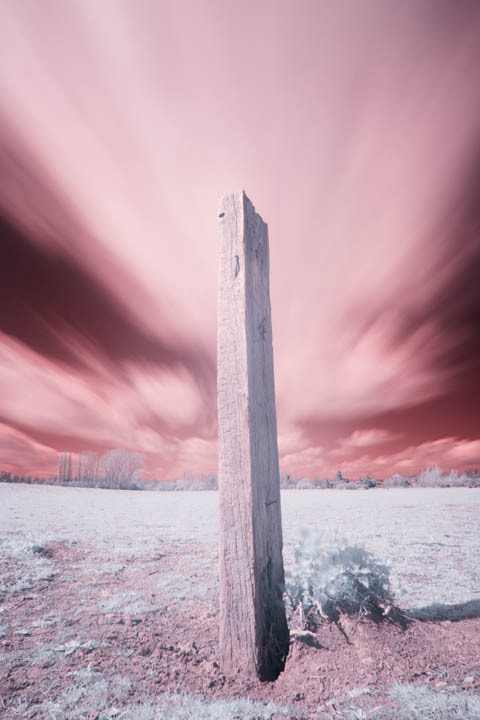 Whereas with a converted camera you'd get an image that is mostly infrared with a bit of red. This does depend on the strength and quality of the infrared filter you are using though. Some infrared filters let through more red light than others, and some only let through infrared light. I did previously look into the use of an unconverted camera for infrared photography here: Can the unconverted Fujifilm X-A1 be used for infrared photography? But that wasn't a particularly good comparison. 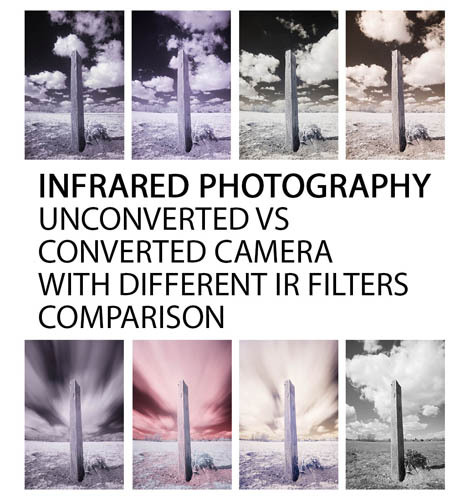 So I decided to try and do a better comparison, looking at how the choice of infrared filter affects the results with an unconverted camera, and how it compares to a converted camera. Doing the comparison has proved very tricky, and I've learnt several things along the way, but I feel I've now got a reasonable comparison I can show and discuss. We'll start off with a colour comparison. The top row of the image was taken with my full spectrum converted Fuji X-M1. The bottom row was taken with my unconverted Fuji X-A1. The Fuji X-A1 contains quite a strong IR blocking filter, similar in strength to the Canon 5D mk II. 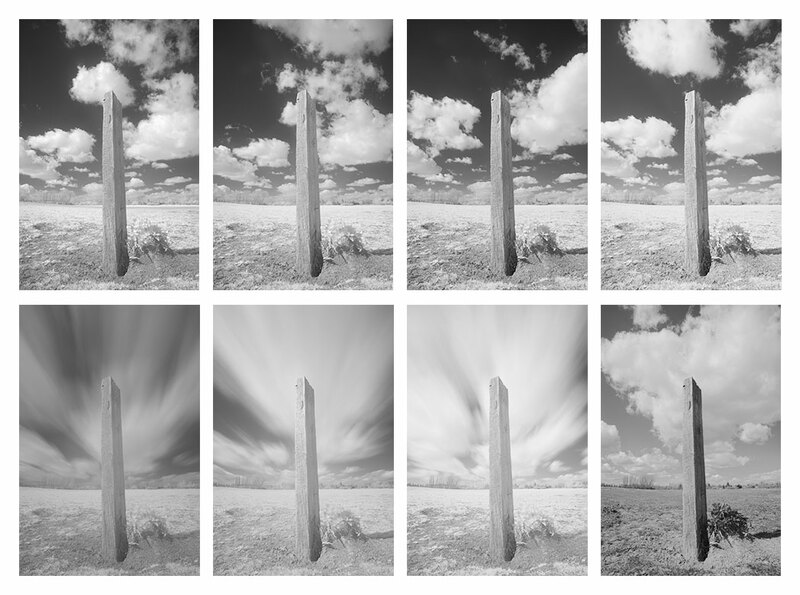 The first image on both rows was taken with a Lee #87 730nm polyester filter. 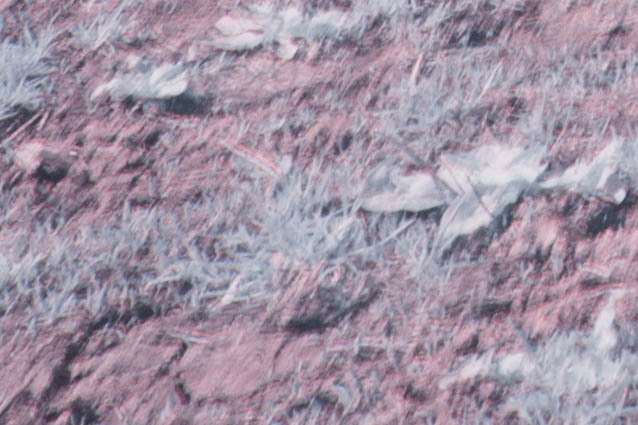 The following three images (on both rows) were taken with Zomei glass filters rated at 850nm, 760nm, and 680nm respectively. The longer the wavelength, the more the filter should cut out visible light. So 730nm and above should pass pure IR, while the 680nm filter should pass some red light as well as infrared. 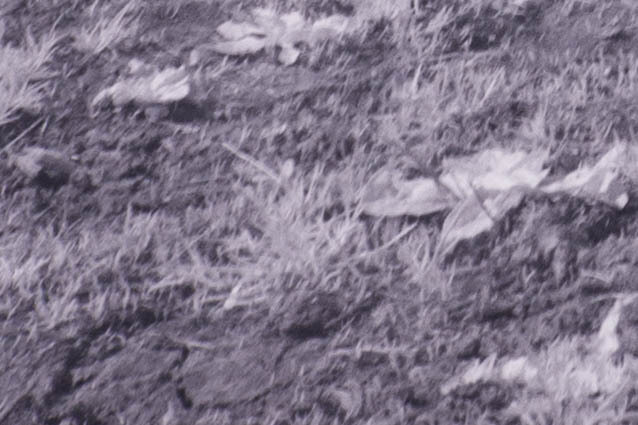 With regards to processing, all images have had their exposure adjusted and white balance set on the grass. 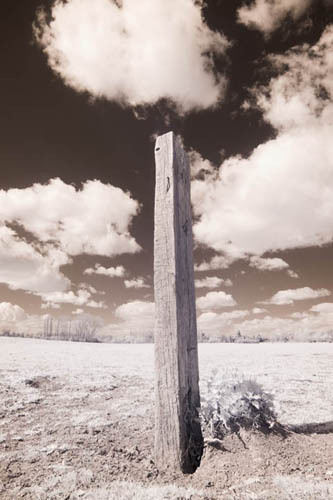 An adjustment brush to correct for the lens' IR hotspot was also used in the middle of each image. The exposure times for the unconverted camera images had to be quite long. Because the infrared filter passes mainly infrared and blocks most visible light, but the camera's internal IR blocking filter only passes a very small amount of infrared light, very little light gets through to the sensor. So a long exposure ( ~ 3 minutes ) is needed to get enough light to form a reasonable exposure. 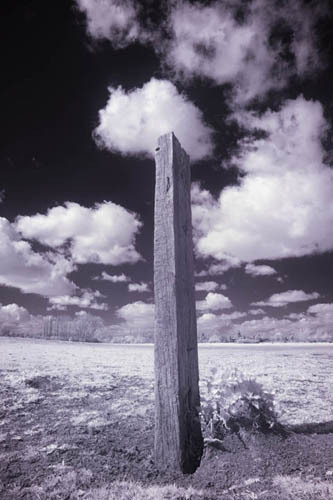 The Lee 730nm filter (first image) only lets through infrared light (no colour) so that the images taken with both the unconverted and converted camera are roughly the same in terms of colour. The Zomei 850nm and 760nm filters (images 2 and 3) are actually letting through quite a bit of coloured light, as can be seen on the unconverted camera images (bottom row). This effect can't be seen on the converted camera images (top row) because the converted camera is so much more sensitive to infrared light. In the time it takes the converted camera to collect enough light for an exposure it only receives a very small amount of red light, compared to a large amount of infrared light. The unconverted camera has to use a long exposure because most of the infrared light that passes through the IR filter is then blocked by the camera's internal IR blocking filter over the sensor. 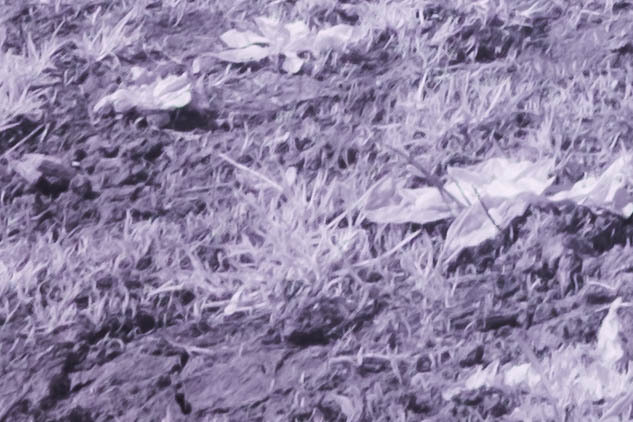 Because the exposure is so long, and the sensor is much more sensitive to colour light than it is to infrared, this results in an image where the colour light has a much stronger effect. The Zomei 850nm and 760nm filters (at least certainly the 850nm filter) should not be passing any colour light at all. When I originally reviewed these filters (Zomei IR filters review & comparison), I only tested them with my converted camera, and so this deficiency was not obvious (or problematic). The final image was taken with a 680nm filter, which lets through quite a bit of red light. You can see that the image taken with the unconverted camera is made up almost entirely from red light, with very little infrared. The infrared is blocked too strongly by the camera's internal IR blocking filter to give an infrared image. In black and white the main difference visible between the images is a lack of contrast in the unconverted camera images (bottom row). I am not sure what the cause of this is. I would guess that a long exposure, plus the presence of the IR blocking filter, gives much more time for light to bounce around inside the camera and lens, and thus cause a form of contrast reducing veiling flare. The other thing that is obvious is that the 680nm filter on the unconverted camera (last image, bottom row) is giving an image with very little IR. The grass is much darker and the sky much brighter than the corresponding image shot with the converted camera (top row). Now, those images above may look fine when displayed on the web. But the images that combine larger amounts of coloured light with infrared light (i.e. those taken on the unconverted camera with the Zomei 760nm and 850nm filters) have some significant issues at the edges when viewed close up. 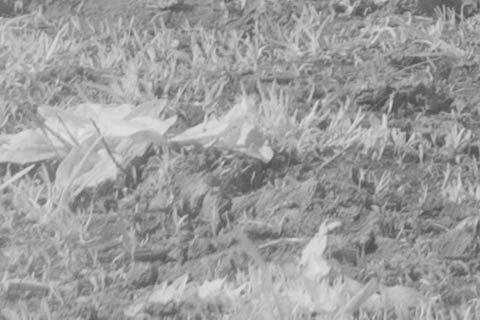 You can see in the crop above, there is a kind of double image effect, with one offset slightly from the other. What is happening here is that the lens focuses visible light and infrared light at two different distances. So we end up with a visible light image focused at one distance, and an infrared image focused at a further distance, with one overlaid on top of the other. 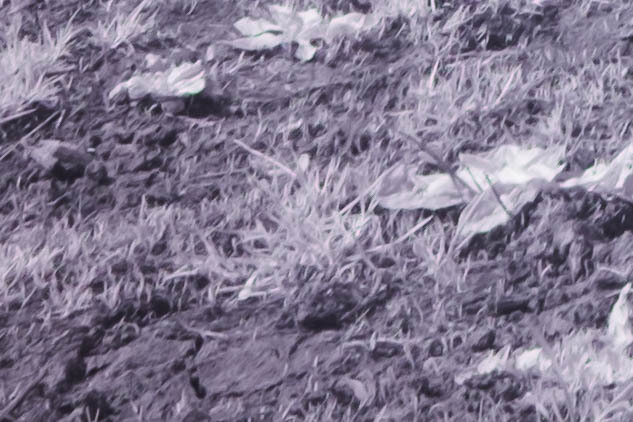 If anyone has any ideas why the 'pure IR' image would not be sharp on an unconverted camera, I'd love to hear them. 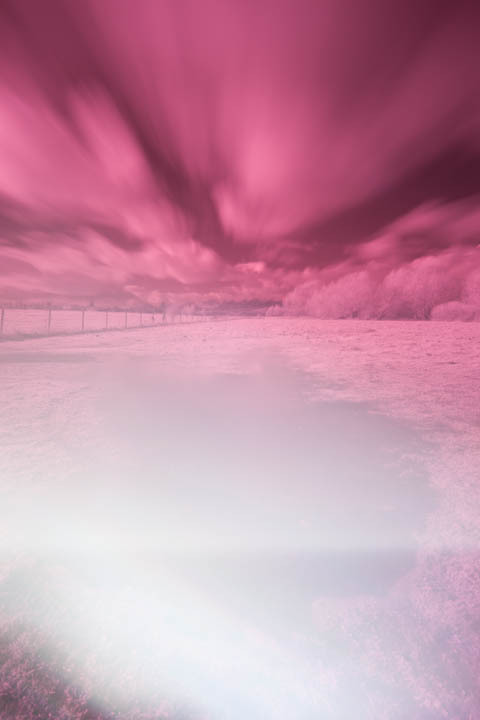 Unfortunately, while you can find lists of lenses that are deemed to be suitable or unsuitable for infrared photography, these only tend to consider whether the lens has an IR hotspot or not. I have not seen any details posted about the amount of focus shift in infrared that different lenses have. At first I thought this was flare from the puddle. Then after more testing I thought it might be a light leak from the viewfinder. Then after more testing I found the actual culprit - a light leak either between the adapter and lens or the adapter and the lens mount. Now, it's not like the lens or adapter were loose at all. And trying to put a piece of masking tape on the adapter made it too thick to fit. So the tolerances must be very tight. I managed to solve the issue by putting gaffer tape around the area where the lens mounts to the body, completely covering up any chance for a gap that light could leak through. But this isn't a very practical solution since it means the lens is stuck to the camera body unless you remove the tape. 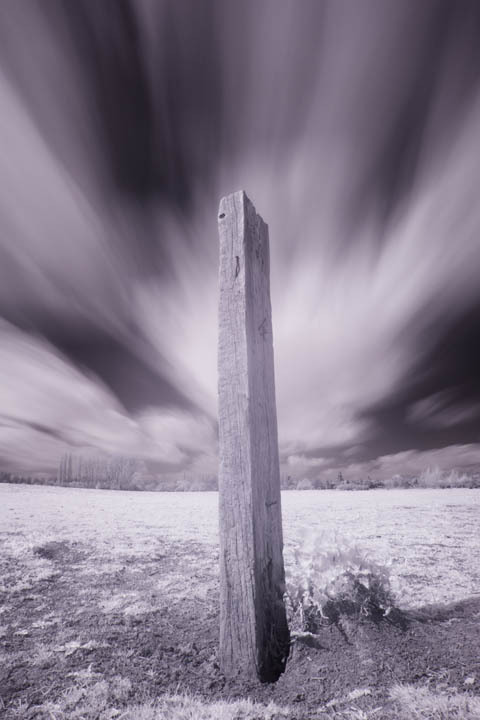 So, if you're using a lens with an adapter on your unconverted camera, be aware that you may run into this issue when attempting infrared (or any kind of long exposure) photography. With an unconverted camera that has a strong IR blocking filter (most modern cameras), infrared photography is possible but fraught with difficulties. You will need to use a long exposure. Unless going for a pure IR image, you want a lens that displays no (or minimal) infrared focus shift. 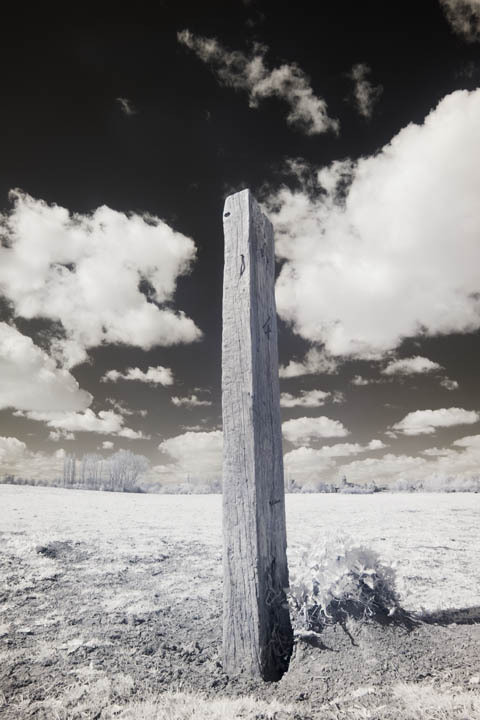 And if going for a pure IR image, you need to be sure that the infrared filter you're using is a good quality one that really does only pass infrared light. Hi, I really enjoyed reading your review of the Zomei IR filters Do you find yourself using your Lee filters more or the Zomei? Have you had better luck with any other brands? 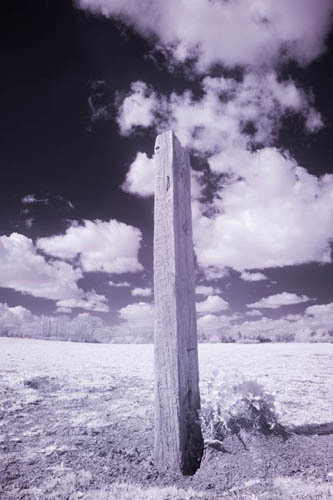 For IR work I nearly always use my converted camera, and the Zomei IR filters work fine there. If I was using a standard camera, I would take a look at the Hoya R72, which seems to be very popular. But with a converted camera, the Zomei filters are plenty good enough so I don’t have any need to pony up the extra cash for the Hoya. The only Lee filter I’m using at the moment is a #12 Yellow polyester filter, which I’ve cut and mounted in a cheap UV filter frame. I’d actually prefer a glass filter, but #12 Yellow glass filters seem to be pretty expensive. Hi Dave- I’ve enjoyed reading your posts- great information and interesting variations. I was wondering if you could advise me. I’m considering getting a full spectrum camera (or making a conversion), and have my eye on a used Fuji IS pro. Do you think that camera still holds up against newer ones in the realm of full spectrum photography? I shoot with a Nikon, and have a bunch of Nikon Fx and Dx lenses, so the Nikon compatibility of the Fuji is appealing. I know the Fuji has its quirks- I used to own a S3. What are your thoughts? I don’t think the IS Pro compares that well to modern cameras really. You can’t take photos in liveview mode, and high ISO performance isn’t very good. If you’re shooting with a filter that means you can’t see through the viewfinder (such as an IR or UV pass filter), then you’re stuck with the antiquated liveview implementation to try and frame the image. This is particularly problematic if trying to shoot handheld. You also need to shoot RAW+JPEG if you want to be able to zoom in much when reviewing images on the camera – not a big deal, but you don’t have to do that with Nikon. I’d suggest getting another Nikon body (the more recent the better) and having it converted. It will have a much more usable liveview, better high ISO, more resolution, and depending on how new it is, similar dynamic range (though the DR will be in the shadows, whereas with Fuji it’s in the highlights). I think the IS Pro is quite collectible though. Do you have any IR cameras you are selling? I may be interested in purchasing a used one as a beginner. Apologies for the rather delayed reply. I don’t have any for sale, you’re best off checking eBay as there are a few sellers (particularly in the US) who sell cameras they’ve converted. Typically these are quite a bit cheaper than buying your own and then having it converted. I have a potential great application for infrared pictures that required the blackest skies in Black & White or a Color pictures. I’ve seen some great pictures that I would like to be able to recreate in Live Pixels web site but they have a problem of being unable to tell me exactly how they are obtained. I rented a converted camera from Barrow Camera specially telling them what I wanted to do & they sent me a Full Spectrum converted N5500 with several filters. Despite several phone calls too them & Live Pixel requesting the specific procedures, I could not obtain the black sky I wanted no matter what settings I used. Something kept evading me either technically or photographically. I’m a retired Boeing Quality Assurance Engineer who has run thousands of tests on airplane parts & ham radio antennas (& pictures since 1936) but could not come up with a combo that gave me the black sky’s with a full spectrum camera. Barrow Lens was of no help whatsoever. Then finally Live Pixel says you need a camera converted to B&W only (4th call). Your pix examples show pretty much what I’m after but I need to know for sure what version to get a new camera converted to & what specific filters or contrast ratio’s to use. I’m totally disgusted with the menu driven N5500 but will have to put up with the menu very slow nonsense with a fill chip camera also. They need detailed videos on how to use all their features so one can quickly use them. I’d like to be able to use one converted for full spectrum if possible as I really like all the color variations of pictures one can get as I have many applications for those pictures also. I have a full very polite report I sent to Barrow Lens (on their poor marketing renting converted cameras & suggestions on how to improve it I’d like to send you). I am 88 & retired with limited funds or even time left in my life to learn all I need to know to get up to speed on infrared. I want to take off running with infrared as soon as possible. Dave On the pictures with the possible light flare in the sky (not cloud shaped) was it from the light leaks you mentioned or was the cloud actually shaped like that & then at a later time? They had a rising shape I don’t ever seen in clouds. The flare picture you showed had the flare in the bottom of the picture & was rather broad. I can’t see how near black the sky would have been near the top of the picture. My goal with either conversion is the blackest shy in the upper 2/3’s of the shy. Would it be worthwhile to invest & experiment with a Zomei 680 or 780 filter on an unconverted camera to get the feel of it even with the longer exposures? How fast are the snap shots with a converted camera to the unconverted camera? Fixed objects would be stable but trees would be blurry depending on the wind but I’d like to try it. I’m using a D2X now but am considering a full frame new camera that I would convert for B&W or Full spectrum only (maybe even the new 850). I’d like to see a combo camera with a way to shot either pictures that it seems Nikon could mop up the Infrared & Conventional market. I could still use them with a converted camera later. On your picture comparison showing what filter was used, it would be handy to also show the shutter speed or equivalent ISO. Were they hand held or could have been? I’m sure a tripod was used on the unconverted shots. Have you seen the full page sample pictures on Live Pixels web site? They are great, mouth watering & show 4 of the black sky pictures I want to duplicate but cannot find out how they were made. First of all, apologies for the delayed reply. I’m very busy at the moment, so haven’t had any time for photography (or updating the website) for the last year or so. I’m not sure what you mean with light flare in the sky? 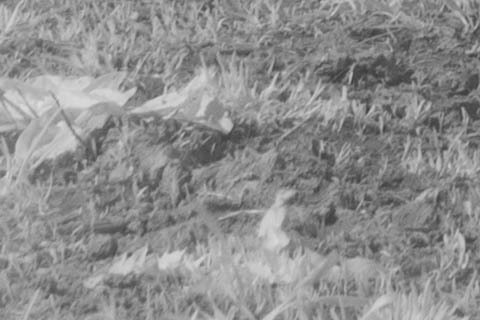 The unconverted camera images probably had some veiling flare, but that just reduces contrast across the whole image. The only image here with a light leak was the one taken with a 5D2 and adapted lens, and the light leak is very visible over the bottom half of the image, not the sky. In general you could expect an exposure time of something like 1/200s f/8 ISO200 with a converted camera or 3 minutes at the same settings for an unconverted camera. Experimenting with filters on an unconverted camera is a relatively cheap way to see how you enjoy IR photography before splashing out on a converted camera. And then you can still use the filters on the new camera. The most popular (and probably well-regarded) IR filter is the Hoya R72, so I would probably suggest that over the Zomei (note I have no experience with the Hoya filter though). 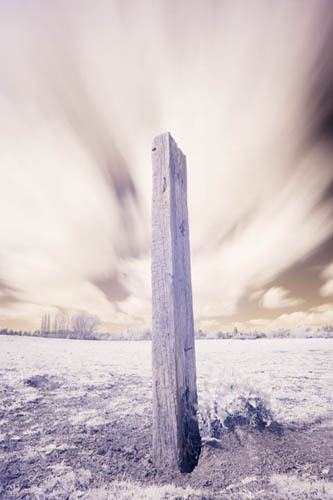 However, if your main aim is dark skies, then this will become more difficult if using an unconverted camera. 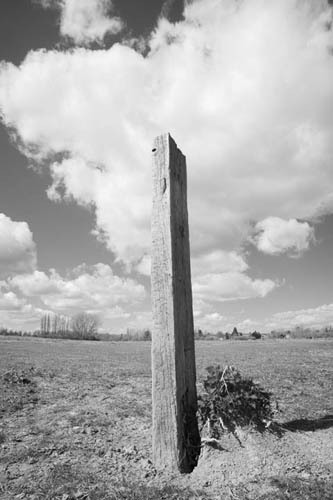 Due to the long exposures you’ll need to shoot on a day with no clouds (or very few clouds and no wind). Otherwise the clouds will blow across the sky during the exposure, as in the example images with my unconverted camera above.